Sometimes, good food is as simple as a few potatoes and some seasoning. It doesn’t have to be complicated; the beauty is often in the simplicity of a dish. A little freshly ground black pepper, a smattering of olive oil and a little sea salt are frequently all you need for nourishing, delicious food. Anyone who knows me well knows I could write a book singing the praises of potatoes. Such humble little vegetables yet so versatile. There are a million things you can do with them, from roasting to mashing to boiling to chipping, and being English I am well versed in all of these. 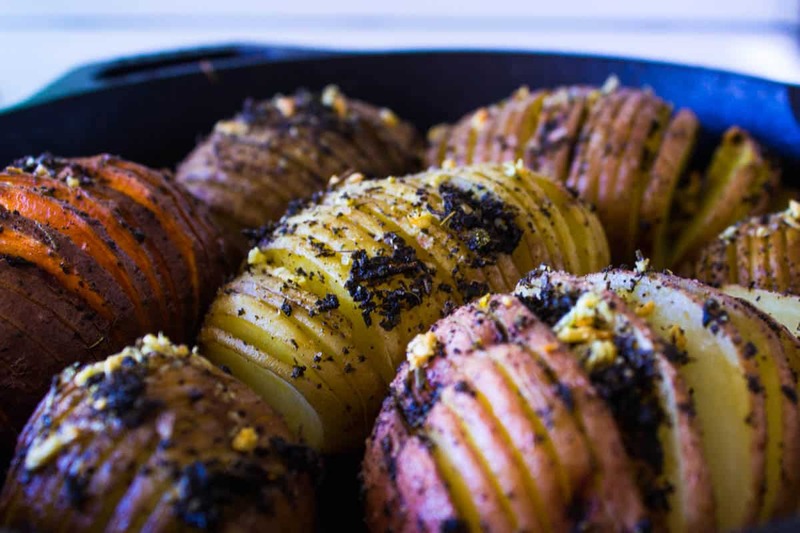 Recently though I discovered Hasselback Potatoes, and they’re a bit of a game-changer! 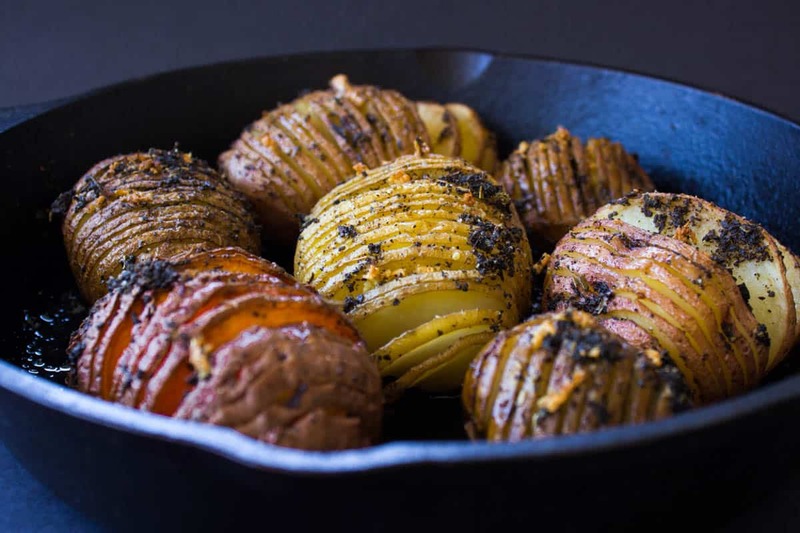 All varieties of potato (and indeed many other root vegetables) work with this recipe, but they will all taste slightly different so do experiment to see which type you prefer using. Personally, I quite like using baby or new varieties, as I enjoy their sweeter taste and more delicate texture. Preheat the oven to 405°F/200°C. Place the handles of two wooden spoons on a chopping board on either side of your first potato. Using a sharp knife, cut slices about 3-5mm apart into the potato as far down as the spoons allow (the wooden handles will stop the knife slicing all the way through, making sure you don’t cut it in half). When finished you should have one potato, still intact but covered in tiny slices. Repeat this process with the remaining potatoes. If you have a pestle and mortar, grind the sage into a paste (if fresh) or a powder (if dry). If not, chop the herbs finely with a knife and place in a small bowl. Add the olive oil to the sage and mix thoroughly. Place the potatoes on a baking sheet and using a pastry brush, coat them with the sage/olive oil mixture. Season with salt and pepper and bake in the oven for 45 minutes. After this time remove the potatoes from the oven and sprinkle the crushed garlic over them, pushing it down in between some of the slices so that they can absorb the flavour. 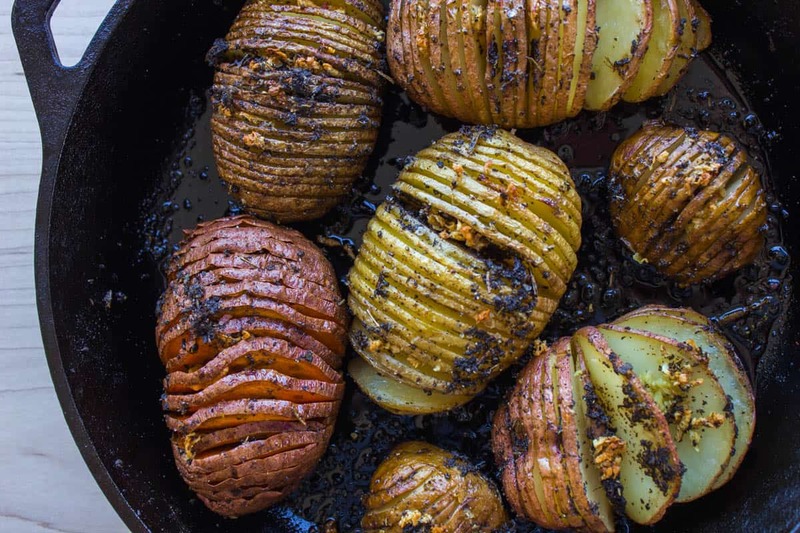 Using your pastry brush, take this opportunity to quickly re-coat the potatoes in olive oil (as there will likely be quite a bit in the bottom of the pan) and place them back in the oven for another 30 minutes. 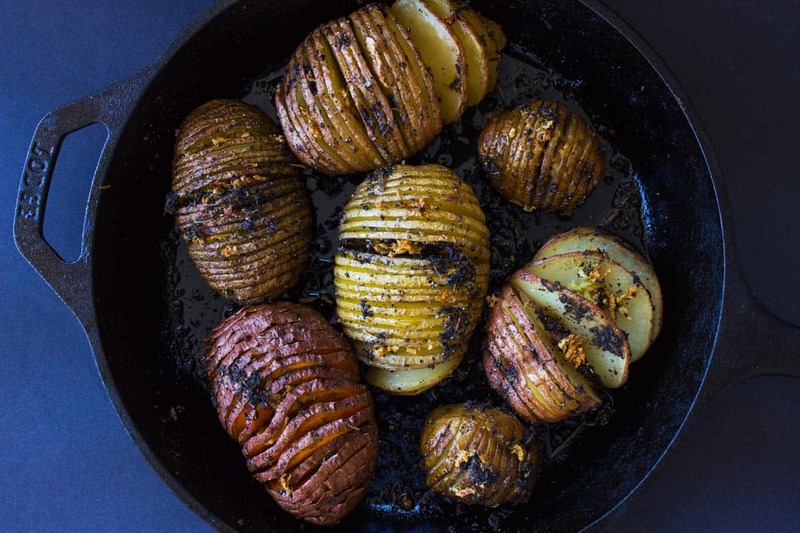 Remove and serve teh hasselback potatoes exactly as they are, or with some freshly chopped herbs sprinkled over them for extra colour.